Kotilingeshwara Temple or Koti Lingeshwara Temple is a famous Lord Shiva Temple situated in the village of Kammasandra in Kolar district of Karnataka, India. Kotilingala Temple is well known to have the biggest Shiva Linga in the world, measuring 108 ft (33 m), the only one of its kind. Associated with the tallest Shiva Lingam is a 35 ft (11 m) tall Basava, surrounded by numerous small Shivalingams which spread over an area of 15 acres. 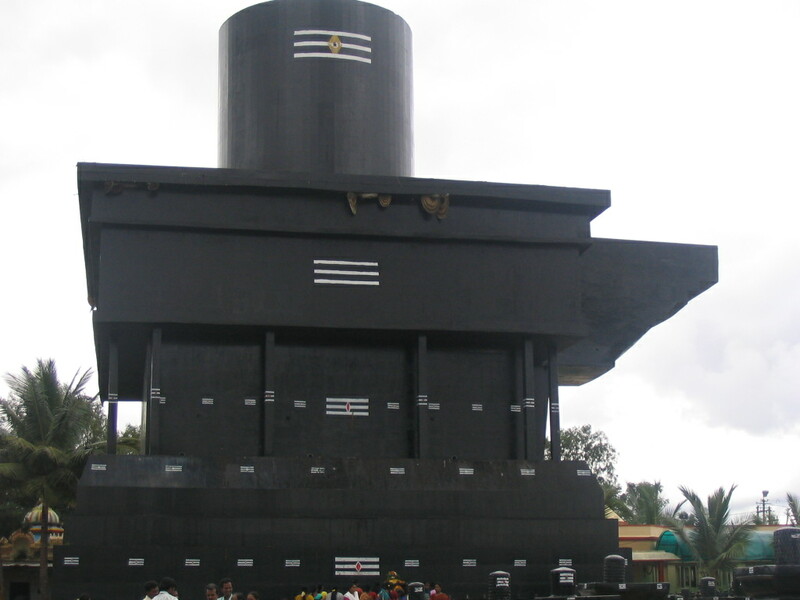 The entire project includes the installation of One Crore Shiva Lingams of various sizes and hence the name ‘Kotilingeshwara’. Kotilingeshwara Shiva Temple is about 5 km from Kolar Gold Fields and about 6 km from Aalamaram. The annual Maha Shivaratri Festival celebrated at the temple attracts thousands of devotees from all over India. A huge Nandi (Nandishwara – the Vahana of Shiv) which is 35 feet (11 m) tall lies in front of this huge Shiva Linga. The Nandi stands on a platform which is about 4 feet in height. About eleven small temples of various deities are constructed within the premises of the Koti Lingeshwara Swamy Temple. There are temples dedicated to Lord Brahma, Lord Vishnu and Lord Maheshwara, followed by the main deity temple Lord Kotilingeshwara. Other important temples are Lord Venkataramani Swamy Temple, Goddess Annapoorneshwari Temple, Lord Panduranga Swamy Temple, Lord Panchamukha Ganapathy temple, Lord Rama, Lakshmana and Sita Temple, Lord Anjaneya Temple, Goddess Kannika Parameshwari Temple and Goddess Karumaari Amma Temple. A Shiva Linga called "Shiva Panchayathi" is installed inside the Goddess Kannika Parameswari temple. The idols of Lord Ganesha, Lord Kumaraswamy, Goddess Parvati and Nandi are arranged around the Linga. These idols are displayed in a way that all these Gods are offering their prayers to the Linga. A water tank which is close to the Linga is used by the devotees for performing Abhishekam to the Lingam. There are two Naga Linga Flower Trees or Cannon Ball Flower Trees in which the unmarried women tie a yellow thread around it, offering prayers to Lord Lingeswara for a happy married life. Worship services are performed to all the Lingas everyday at 6:00 am and 6:00 pm by 10 priests, along with drums and music. Mantras are recited and water is poured by the priests on each and every installed Linga. Devotees can offer their prayers to Lord Kotilingeshwara by installing Lingas. The Lingas will be installed in the name of the devotee and the names of the devotees are carved on the Lingas. Prayers are offered everyday for the welfare of the donator. Every afternoon, Annadhanam (free food) is provided to all the devotees. Kolar is about 68 km from Bangalore. Buses ply on regularly from Bangalore. Bangalore International Airport is the nearest airport. Bangarapet Railway Station and Marikuppam Railway Station are the nearest railheads to reach Kotilingeshwara Shiva Temple.